Congratulations to my client, Tawny Clark, who is featured in the August issue of Oxygen Magazine. 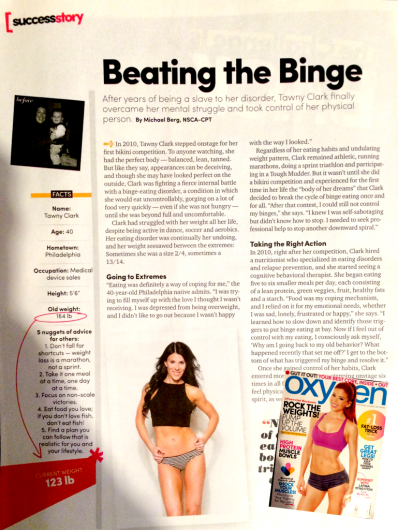 The article talks about Tawny’s battle with binge eating disorder. I am very proud to be able to say I have helped her in her journey to manage this very common condition (and prepped her for the photo shoot!). She looks great and more importantly, she does not let her food issues control her life. While I do help people lose weight, I take even more pride in helping my patients and clients develop and maintain a healthier relationship with food. At the end of the day, it doesn’t matter how lean you are if you have to be miserable to do it.